Summer is monsoon season in New Mexico. I grew up in Florida so I have to admit, I thought monsoon season was a bit overrated when I moved here seven years ago. 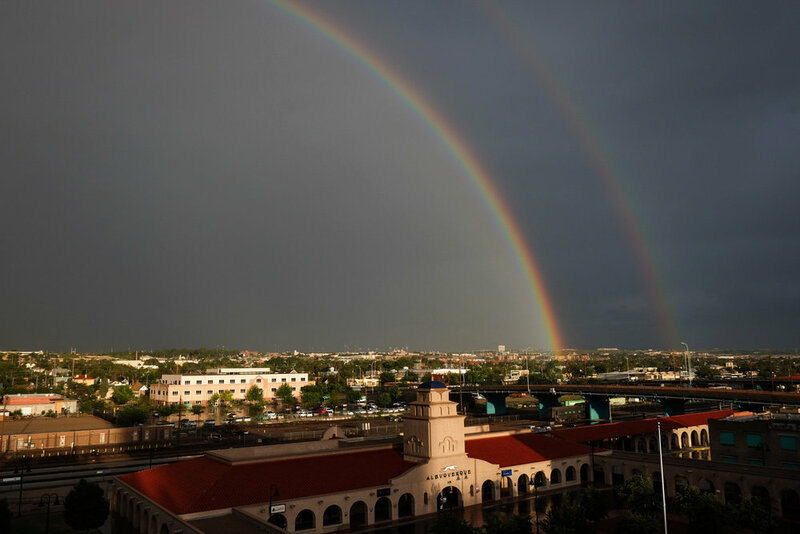 After living with daily Florida storms that would last a few hours during the summer, quickly followed by hurricane season, monsoon season was basically, "we get 15 minutes of rain during the summer in New Mexico." Over the years though I have come to appreciate monsoon season. The storms that roll through are so brief and yet the building clouds, the swirling sky, the moisture, and the sunsets left behind are all so memorable and refreshing. We photograph the rain, the storms, the (occasional) damage, every year. This year is no different. It was another day in a week of anticipated daily rain and we needed an A1-worthy rain photo to go with a story. Problem was, it had yet to rain that day so the only art we had was going to be old for the next day's print. Right around deadline (right before sunset) the sky started to darken but the only staff photographer who was working at that time had an assignment that he couldn't leave. So I grabbed my camera and ran out the door in search of a rainy photo. I normally only work the desk now so it's rare I get to do any dashing-out-the-door in search of a photo. I went to an overlook of the city downtown that I had found another day during a storm. The rain wasn't spectacular, there was no lightning, and the clouds were just a solid layer of gray. Of course. I waited it out and just when I was about to give up hope because the rain was stopping and the deadline was inching so very close, I turned around and there was a double rainbow over the city. Click. Run around the area looking for the best composition. Click. Click. And then it faded away.